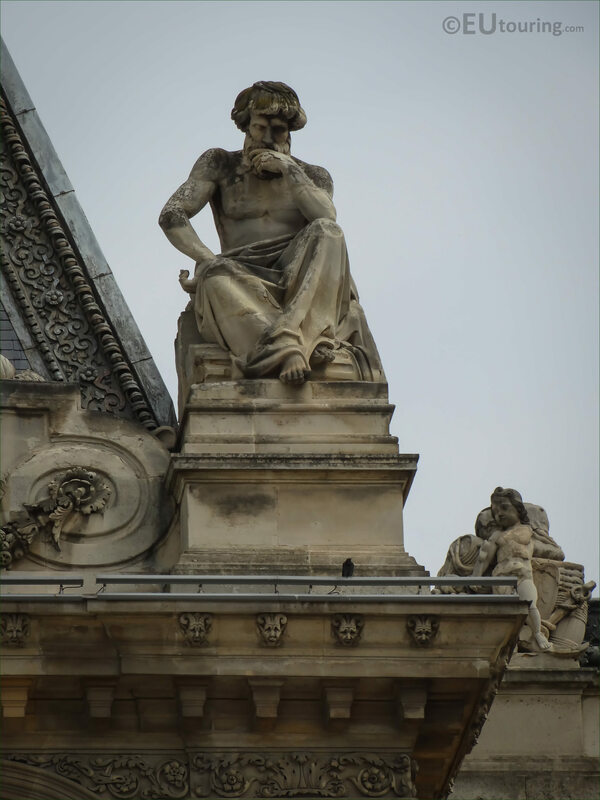 We were at the Musee du Louvre, which is located in the 1st Arrondissement of Paris, when we took these high definition photos showing a statue called La Meditation on the Pavillon Turgot, that was sculpted by Jean Marie Bonnassieux. 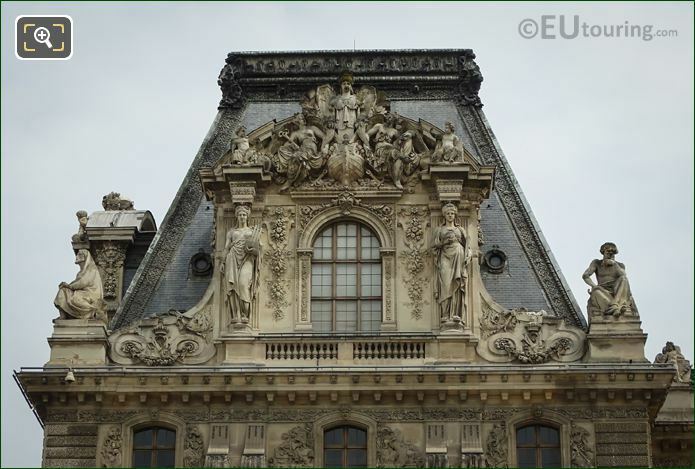 This first HD photo shows the top section of the Pavillon Turgot, which is a wing of the former Palais du Louvre, and you can see this facade from the courtyard called the Cour Napoleon, yet located on a corner, the other facade of this pavilion faces the Cour du Carrousel. Now this next image shows the statue called La Meditation, which is an allegory depicting a gentleman deep in thought, or in meditation, and this is located on the pediment on the upper level of the Turgot Pavilion, to the right hand side of the dormer, and was put in place in 1857 during the restoration of the former royal palace turned museum. 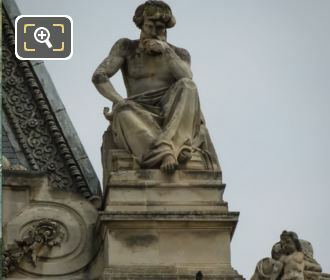 So this allegorical statue was produced by Jean Marie Bonnassieux who was born in the Loire region of France in 1810, yet studied at the Ecole des Beaux Arts in Paris, becoming a co-winner of the Prix de Rome with Auguste Ottin. And as well as this statue of La Meditation, he also sculpted a pediment for the Pavillon Marsan wing plus received several other public commissions for different tourist attractions including the Palais de Justice and more for the Musee du Louvre. 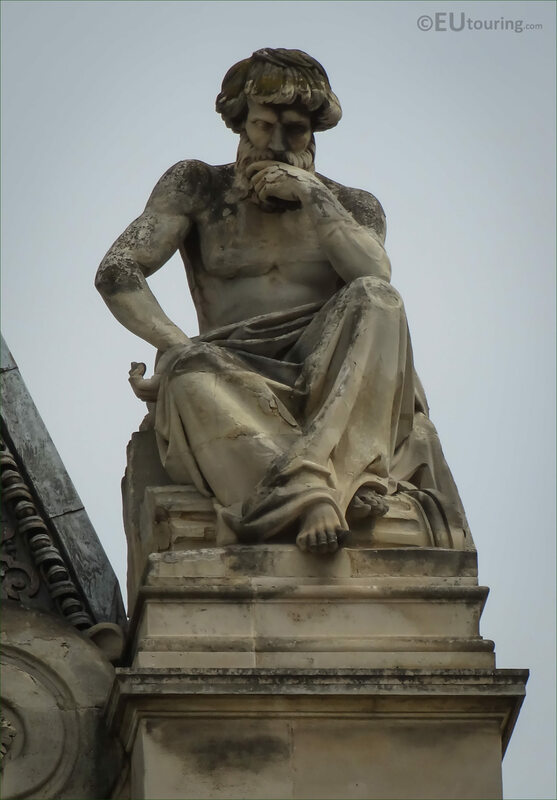 Yet his most famous work is the enourmous iron statue called Notre-Dame de France, which is located in his home region within the town of Le Puy-en-Valay, that Jean Marie Bonnassieux produced using Russian canons taken in the Siege of Sebastopol.